ARR offers interval training at two locations each Tuesday evening, at 6:15 at the Rose Mofford Track (23rd Ave. and Brown St.) or at Shadow Mountain High School (2902 E. Shea Blvd.) at 6:40 pm. There is no cost or registration. Just show up and have a good time making new friends while getting stronger and faster. If you want to continue to train with either group, please become a dues paying member of the Arizona Road Runners, since the membership fees are what covers the cost of the coach at Rose Mofford and the track usage and insurance fees at SMHS. If you have any questions, please send us an email. The workouts below are from Shadow Mountain High School. Coach Espinoza provides workout details the evening of the workout at the Rose Mofford Track. 2 x (800 – 600 – 600) @ faster than 5K pace, 3 minute recovery, 5 minutes between sets. Finish with a final 800. The workouts below illustrate what we did back in 2017. This provides an idea of the workouts run at Shadow Mountain High School. We run at SMHS from September through June with the fast running starting at 6:40 pm. Over the summer we do hill repeats and some workouts at Mescal Park in Scottsdale. Email to inquire about details. Intervals again this Tuesday, June 20th with the fast running starting at 7 pm. 4 x (800, 200) + a final 800. Run the 800s at a little faster than 5K pace, 3 minute break. Run the 200s at 1 mile pace. Walk back to the original start line, hydrate and repeat. Finish with a final 800. Intervals again this Tuesday, June 13th with the fast running starting at 7 pm. The workout is 5 x (2 x 400) at one mile pace. You do this workout in sets of two. Run a lap, walk a half lap, run a lap, walk back to the initial start line, have a quick refreshment and repeat. Intervals again this Tuesday, June 6th with the fast running starting at 7:00 pm. 2 x (800 – 400 – 200 – 1000) at 5K pace down to faster than 1 mile). Rest intervals of 3, 2 and 1 minute. 5 minutes between sets. Intervals again this Tuesday with the fast running starting at 6:40 pm. 4 x (1000) @ slightly faster than 5K pace, plus a final 800. 4 minutes between intervals. Walk across the football field to the start line. Most of your break is the walk back to the start line. Intervals again this Tuesday May 23rd with the fast running starting at 6:40 pm. 1600, 1200, 800, 2 x 400, 2 x 200 at 10K down to sub-mile pace. Rest of 5, 4, 3, 2 and 1 minute between intervals. Intervals again this Tuesday May 16th with the fast running starting at 6:40 p.m.
We are continuing to focus on workouts leading to the ARR Summer Series #1 on Saturday May 27th. Intervals again this Tuesday, May 9th with the fast running starting at 6:40 pm. 2 x (3 x 800) @ faster than 5K pace, 3 minute recovery, 5 minutes between sets. 2 x (4 x 800) @ 10K pace, 90 second recovery, 5 minutes between sets. Intervals again this Tuesdays, May 2nd with the fast running starting at 6:40 pm. 2 x (800 – 400 – 200 – 1000) with recovery of 3, 2 and 1 minute. 5 minutes between sets. Pace of 5K down to 1 mile. If you are committed to a marathon training workout, try the 3 x 2000 @ 10K pace, 3 minute recovery. That’s a good threshold run. Intervals again this Tuesday, April 25th with the fast running starting at 6:40 pm. 2 x (800 – 600 – 600) @ faster than a 5K pace. Recovery of 3 minutes; 5 minutes between sets. Finish with a final 800. This week, April 18th will be the ARR Open Mile. Everyone is invited to attend. Please arrive early to register for the evening’s one mile runs. Intervals again this Tuesday, April 11th with the fast running starting at 6:40 pm. Best of luck to our runners who will be running the Boston Marathon on April 17th! Intervals again this Tuesday, April 4th with the fast running starting at 6:40 pm. 1 mile – 2 mile – 1 mile at slightly slower than 10K pace, 4 and 7 minutes recovery. 2 x (800 – 400 – 200 – 1000) at 5K and faster pace. Recovery of 3, 2 and 1 minute. 5 minutes between sets. Intervals again this Tuesday, March 28th with the fast running starting at 6:40 pm at SMHS. 3 x (800 – 600 – 400 – 200) @ 10K – 5K pace, 1 minute recovery, 4 minutes between sets. 2 x (800 – 600 – 400 – 200) @ faster than 5K pace, 3 – 1 minute recovery, 5 minutes between sets. Finish with a final 800. Intervals again this Tuesday, March 21 with the fast running starting at 6:40 pm at Shadow Mountain HS. 4 x (1,000) @ faster than 5K pace, 4 minute recovery. Finish with a final 800. Intervals again this Tuesday, March 14th with the fast running starting at 6:50 pm. We do not have access to the Shadow Mountain High School track this week. We will meet at the Rose Mofford Park track, 23rd Ave, north of Mountain View. The track is adjacent to 23rd Ave and across the street from W Brown St.
3 x 2,000 @ 10K pace, 3 minute recovery. 4 x 1,200 @ 5K pace, 4 minute recovery. Intervals again this Tuesday, March 7th with the fast running starting at 6:40 pm. 3 x (800 – 600 – 600) @ 5K pace, 90 second recovery, 5 minutes between sets. 2 x (3​ x 800) @ ​faster than 5​K pace, ​3 minute​ recovery, 5 minutes between sets. Intervals again this Tuesday, February 21st with the fast running starting at 6:40 pm at Shadow Mountain High School. 3 to 4 x (1,600m) @ 10K pace, 3 minute recovery. 1,600, 1,200, 800, 2 x 400, 2 x 200 starting at 10K pace and working down to 1 mile pace. Recovery of 5, 4, 3, 2 and 1 minute. Intervals again this Tuesday, February 14th with the fast running starting at 6:40 pm at Shadow Mountain High School. 3 x (800 – 600 – 400 – 200) at 10K to 5K pace, 1 minute recovery, 4 minutes between sets. 2 x (800 – 600 – 400 – 200) at faster than 5K pace, 3 to 1 minute recovery, 5 minutes between sets. Finish with a final 800. Intervals again this Tuesday, February 7th with the fast running starting at 6:40 pm. 5 to 7 x (1,000) @ 10K pace, 2 minute recovery. 4 x (1,000) @ slightly faster than 5K pace, 4 minute recovery. Your walk back to the start line is part of your recovery. Finish with a final 800. 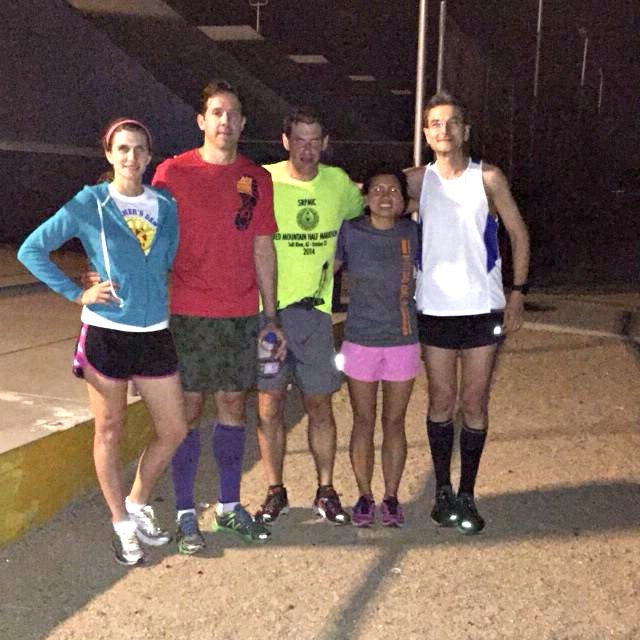 Intervals again this Tuesday at Shadow Mountain High School, with the fast running starting at 6:40 pm. Please arrive earlier to fit in your own warm-up. 1 mile – 2 mile – 1 mile at slightly slower than 10K pace, breaks of 4 and 7 minutes. Intervals again this Tuesday, January 24th with the fast running starting at 7 pm at the Rose Mofford Park Track. Directions to Rose Mofford Track: the key is that the track is accessed from 23rd Ave. You can reach the track by heading south from Peoria Ave or by coming off 19th Ave and heading west on Mountain View Rd. to 23rd Ave. Use maps.google.com and put in 23rd Ave and W. Brown St. and look to the left and you will see the parking lot. 3-4 x( 1,600 m) @ 10K pace, 4 minute recovery. 4 x (800, 300) @ little slower than, little faster than 5K pace; 4 minute recovery. Finish with a final 400. Intervals again this Tuesday, January 17th with the fast running starting at 7 pm at the Rose Mofford Park Track. I think it was more difficult to find the Rose Mofford Track than I realized. The key is that the track is accessed from 23rd Ave. You can reach the track by heading south from Peoria Ave or by coming off 19th Ave and heading west on Mountain View Rd. to 23rd Ave. Use maps.google.com and put in 23rd Ave and W Brown St and look to the left and you will see the parking lot. We are setting up a new marathon schedule that culminates with the Boston Marathon on April 17, 2017. 5 x( 1,000) @ 10K pace, 3 minute recovery. 4 x (1,000) @ 5K pace, 4 minute recovery. Finish with a final 800. Intervals again this Tuesday, January 10th at Rose Mofford Sports Complex track, 9833 N. 25th Ave., 85021 with the fast running starting at 7 pm. Please conduct your warm-up to not interfere with the other ARR group that will be completing their workout on the track. Intervals again this Tuesday. January 3rd at Mescal Park with the fast running starting at 10:20 am. 1 mile – 2 mile – 1 mile at slightly slower than 10K pace. 4 and 7 minute recovery. 2 x (800 – 400 – 200 – 1000) @ 5K pace to 1 mile pace. Recovery of 3, 2 and 1 minute. Five minutes between sets. Intervals for Tuesday, December 27th will be held at Mescal Park, 11015 N 68th St, Scottsdale, AZ 85254. 3 x (800 – 600 – 400 -200) @ 10K down to 5K pace. 1 minute recovery. 3-5 minutes between sets. 2 x (800 – 600 – 400 -200) @ faster than 5K down to 1 Mile pace.3-1 minute recovery. 5 minutes between sets. Finish with a final 800.